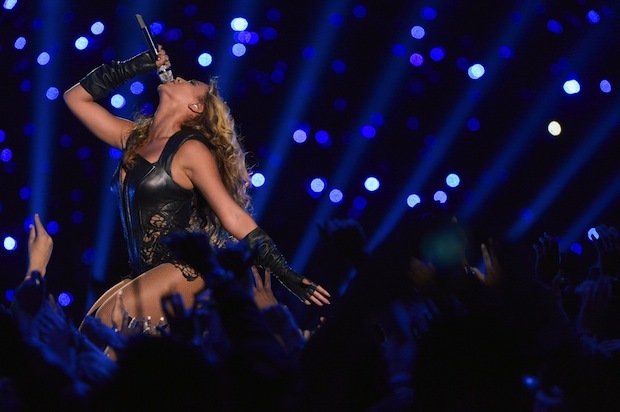 Beyoncé wows the crowd during Sunday's Super Bowl halftime show. Beyoncé wows the crowd during Sunday's Super Bowl XLVII halftime show. Much to the befuddlement of my sports-loving Texas family, football has never been my thing. I&apos;d much rather watch feminist debates and class warfare on Downton Abbey than a bunch of dudes running around and tackling each other for reasons I do not care to understand. And yet, I was compelled to tune in to this year&apos;s Super Bowl halftime show. Why? Football may be America&apos;s sport, but Beyoncé is a national treasure. Last night&apos;s performance was preceded by so much fanfare (Exhibit A: Gawker-issued Beyngo cards) that I wondered if the actual show could possibly live up to the #BeyonceBowl hype. Alicia Keys, Jennifer Hudson and the Sandy Hook Elementary School choir began the evening on a high note, offering poignantly soulful renditions of The Star-Spangled Banner and America the Beautiful. Still, Beyoncé&apos;s halftime extravaganza was the much-anticipated main event, and despite my jittery fears to the contrary, she did not disappoint. Fresh off the controversy of lip-syncing the national anthem at President Obama&apos;s inaugaration, Beyoncé made an obvious effort to display her lovely live vocals on the Super Bowl stage. She panted audibly through her medley of hits ("Love on Top," "Crazy in Love,"and "Baby Boy"), and turned her mic to the crowd whenever she ran out of breath. Did she always sound flawless? No, but she did manage to belt out some stellar riffs in between booty shakes. And flanked by an army of identically leather-clad dancers, she looked stunning per usual. Then, as many sources had predicted, Destiny&apos;s Child groupmates Kelly Rowland and Michelle Williams joined Beyoncé onstage for nostalgic three-part harmonies of "Bootylicious," "Bills Bills Bills," and "Independent Women." They also sang and danced as her "Single Ladies" before quickly rushing aside, allowing Bey to close the show front and center with her hit power-ballad "Halo." The performance was an explosive success, aided even more so by a subsequent power outage that left the stadium in darkness for an additonal 34 minutes. This triumph bodes well for Beyoncé&apos;s continued rise in 2013, drumming up even more positive publicity for the February 16 premiere of her HBO documentary Life Is But A Dream and the January 29 release of Love Games, her first Destiny&apos;s Child album in eight years. But while Beyoncé&apos;s music has inspired legions of devoted fans, her offstage persona has been the subject of increased scandal and speculation. At the zenith of her fame, she has been accused of faking her pregnancy with daughter Blue Ivy, worshipping Satan as a member of the Illuminati alongside husband Jay-Z and being a straight-up crazy person in general. Perhaps people find it too hard to believe that one woman could embody such pristine vocal and physical perfection without the help of the devil and a good surrogate. Maybe her new documentary, which includes deeply personal video diaries of her most vulnerable moments behind-the-scenes, will help to dispel at least some of the rumors surrounding her mysterious inner life. But will her meticulous self-direction still prevent fans from seeing the real Beyoncé, whoever that is? Admittedly, this cover story for GQ magazine&apos;s February issue did not do her any favors in the egomania department. But really, who cares if she&apos;s a diva? In my opinion, a 16-time Grammy Award winner and international superstar has earned the right to be a little full of herself. Beyoncé is an incredibly talented performer (with or without a backing track) and she owns it. Oh, and she also just announced The Mrs. Carter Show World Tour, coming to Chicago&apos;s United Center on July 17. Long live Queen Bey! Follow Leah on Twitter @leahkpickett.